St Pat’s is always so fun – everybody wearing green, drinking green beer, eating green things, rainbows, pots of gold – all that super fun stuff. 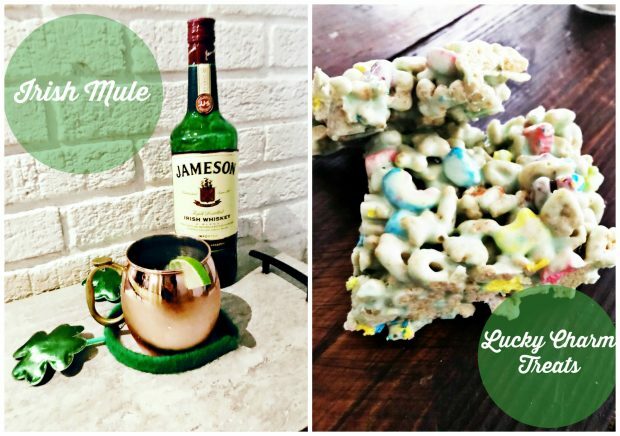 While drinking holidays look a little different with kiddos running around, you can still have a drink and make fun green desserts with Lucky Charms. So, I have two really simple recipes to help you get in the St Pat’s spirit! fill your glass with ice (we used copper mugs in true mule fashion). pour in whiskey and lime juice. top with ginger beer. (we filled the rest of the cup with the ginger beer, but if you like the taste of whiskey, you don’t have to use so much). stir – add the lime and mint to garnish. microwave butter and marshmallows in 30 second increments until melted. pour mixture over the cereal, and then press into your greased pan. pair with a glass of milk and enjoy! I had a lot of fun making the treats – even if I really do hate making things with marshmallows because everything becomes sticky. 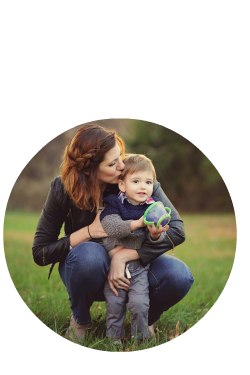 But it is simple enough to do with a toddler, and they definitely love getting to eat them! B and I did too. Hope you have a happy (and safe!!) St. Patrick’s Day! So fun and festive!!! I need to get some lucky charms and make those. They look delicious! On our way to the grocery store Sunday Chris said B is a fancier drinker than he is with his lime and his mint. I was like ohhhhhh that was what was in our sink!!! Chris had emptied his cup out in the sink and left his garnish sitting there haha. I bought hubs a set at Christmas of Jameson & Ginger beer. We haven’t been adding the lime, but still so yummy! We’ve stuck with Fever Tree ginger beer- almost spicy, so good!